A former industrial building in Bedminster ‘re-imagined’ as an artist-led contemporary art gallery officially opens next Friday. 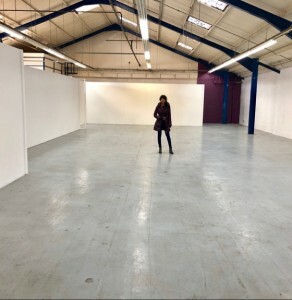 Kosar Contemporary on Malago Road is the largest independent art space in Bedminster and has been established in a 6,000 sq ft former light industrial factory by visual artist Zarabéa Esfendiar Kayani in creative association with Bristol arts charity Gathering Voices. It is the latest in a series of ‘meanwhile’ creative uses of outdated and hard-to-let industrial units by arts groups around the city with Bedminster now boasting a growing artist presence. Zarabéa, pictured in the gallery space, has spent the past few months converting the building into the Paradise Studios, a new creative hub for contemporary artists studios, and the spacious Kosar Contemporary art gallery. Kosar Contemporary now plans a curated program of non-commercial exhibitions that will be relevant to the local community as well as the art world in the wider context. The inaugural exhibition will be The Artist Project Space’s third collaborative exhibition this year. The exhibition is titled ‘SPACEs reimagined’ and will be curated by John Steed. 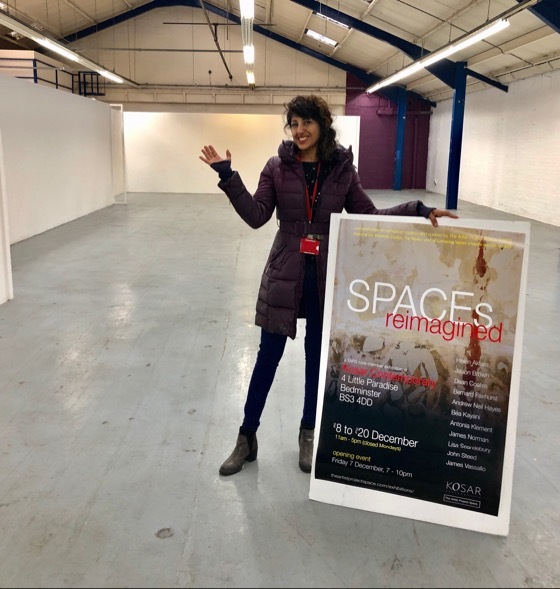 ‘SPACEs reimagined’ will include paintings, sculptures, photography and multidisciplinary art works on the theme of the recycling of a redundant industrial space to an art space in the context of technological, political and societal change. Gathering Voices, a Bristol-based innovative arts charity working primary in the areas of music, performing arts, mentoring and youth leadership, has taken on The Works, a collection of ex-commercial, industrial and office buildings, that include the buildings now occupied by Paradise Studios. The ‘SPACEs reimagined’ exhibition will be open daily (except Monday) between 11am and 5pm from Saturday, December 8, to Thursday, December 20. For more information on The Artist Project Space, email contact@theartistprojectspace.com or phone 07506 327358.